The Sheikh al-Ra'is Sharaf al-Mulk Abu ‘Ali al-Husayn b. ‘Abd Allah b. al-Hasan b. 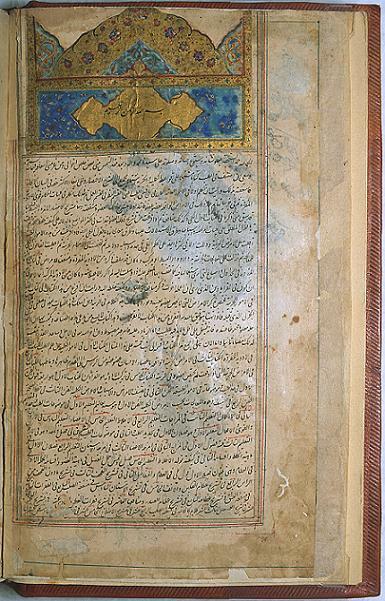 ‘Ali Ibn Sina, in Latin he is know as Avicenna and his most famous works are those on philosophy and medicine. His philosophical views have engaged the attention of Western thinkers over several centuries, and his books have been among the most important sources in philosophy. 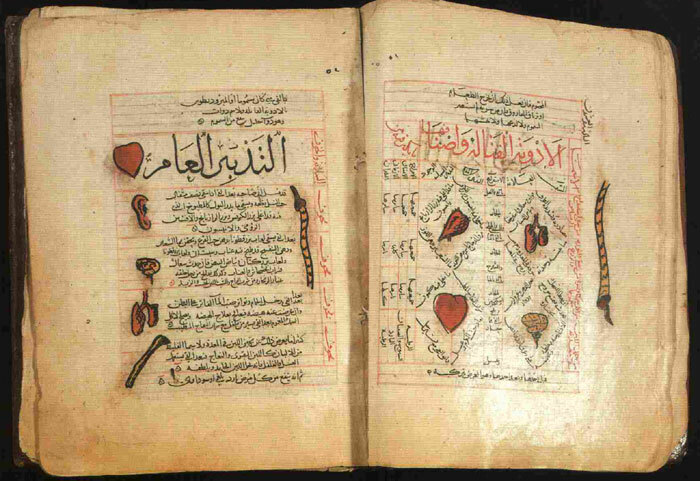 In medicine, his encyclpedic book, al-Qanun (The Canon) - Al Qanun Fi Al-Tibb (The Canon of Medicine)- was translated into Latin towards the end of the twelfth century CE, and became a reference source for medical studies in the universities of Europe until the end of the seventeenth century. 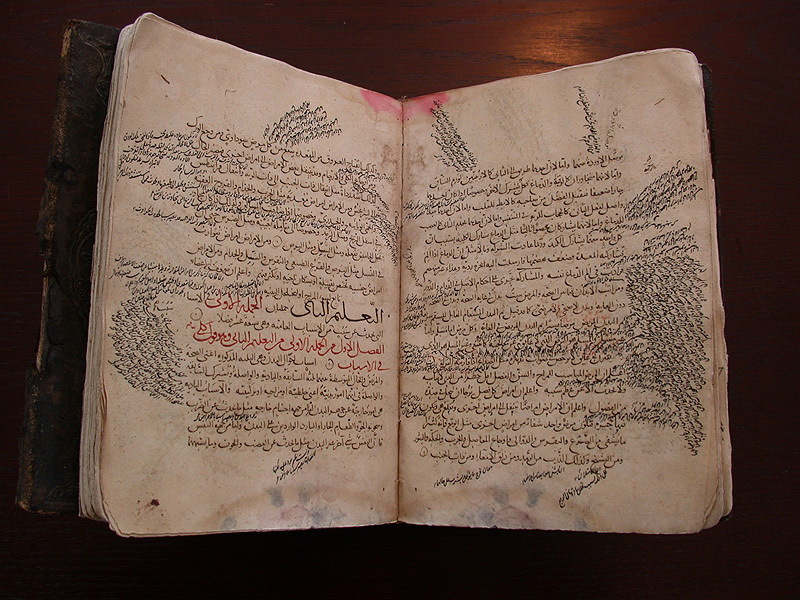 Note: Composed by Cem Nizamoglu, first published in 1001 Inventions website. [Ibn Sina, or Avicenna, lived in Hamadan and Jurjan from 980 to 1037 CE, and acquired great fame in mediaeval European medicine. [Ibn Sina has attracted the attention of scholars, past and present, who have written books, treatises and articles on him. One of these aspects, however, has not been very widely discussed, namely his views on education. Figure 5. 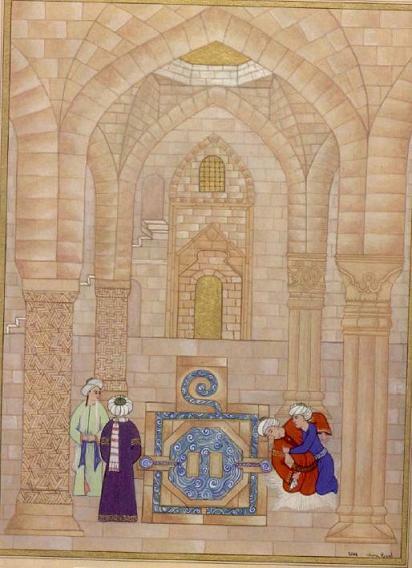 Ibn Sina drawing by A. Suheyl Unver. (Source). Figure 6. Commemorative medal issued by the UNESCO in 1980 to mark the 1000th birth anniversary of Ibn Sina. The obverse depicts a scene showing Avicenna surrounded by his disciples, inspired by a miniature in a 17th-century Turkish manuscript; whilst on the reverse is a phrase by Avicenna in Arabic and Latin: "Cooperate for the well-being of the body and the survival of the human species" (Source). The UNESCO established the Avicenna Prize for Ethics in Science in 2002 (see brochure: Avicenna and the ethics of science and technology today, UNESCO, 2004). Figure 7. 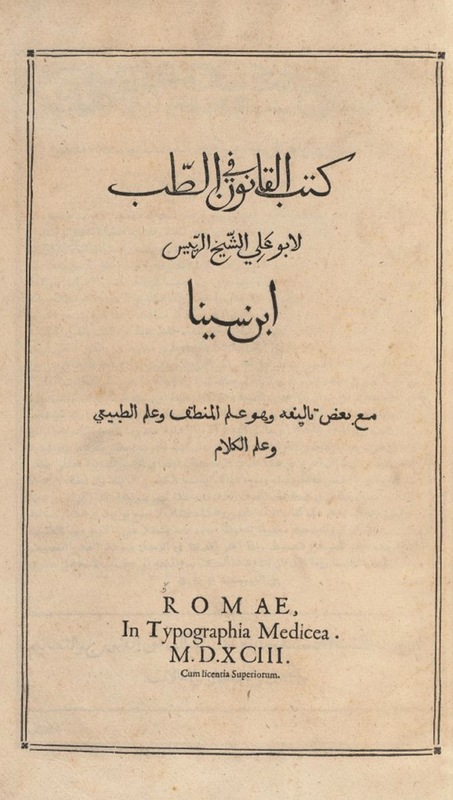 The title page of a Latin Edition of Ibn Sina’s “Canon of Medicine” together with two of his other works; Cardiac Medicines and the Medical Poem (the Cantica Avicennae) published in 1562. The page on the right is page 1082; the beginning of the Cantica section. Courtesy of Google ebooks. [The seventh and last art mentioned in the fourth book of the Canon is assigned to the topic of "zina" ("ziynet" in Turkish), that is physical appearance. It consists of four articles. Although the term "zina" calls to mind ornament and ornamentation, when we take a look at the text in the Canon, we may observe that it deals with appearance. That is to say the hair and body care; as well as skin diseases and their treatment. What is more, it also refers to subjects such as obesity and emaciation that affect the appearance, and preventive methods and measures for all of these are discussed. Figure 8: An illustrated page of theCanon in a Hebrew translation. The miniatures shown here are the three basic stages of a physician's visit with a patient: the examination of the patient, the consultation with attendants, and possibly a written prescription or treatment procedure. (Source). Figure 9. 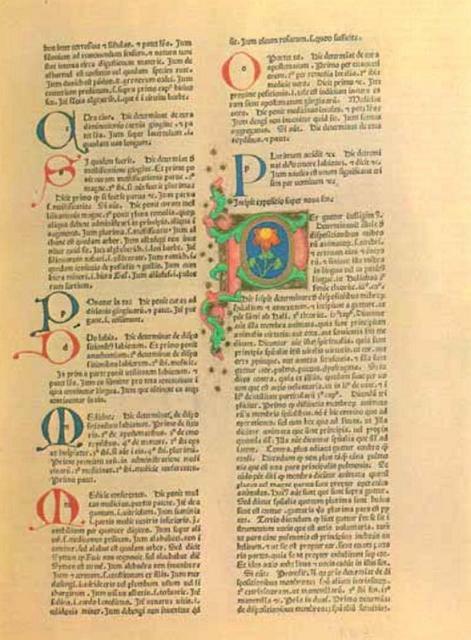 Page from an illuminated manuscript of the Latin translation of the Canon of Medicine by Ibn Sina (Source). 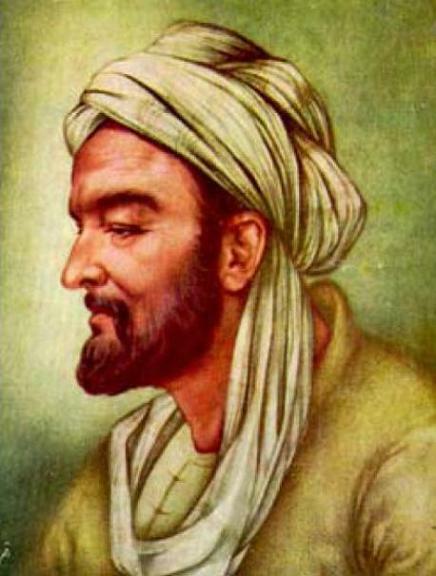 "Despite a general assessment favouring al-Rāzī’s medical contributions, many physicians historically preferred Avicenna for his organization and clarity. Indeed, his influence over Europe’s great medical schools extended well into the early modern period. 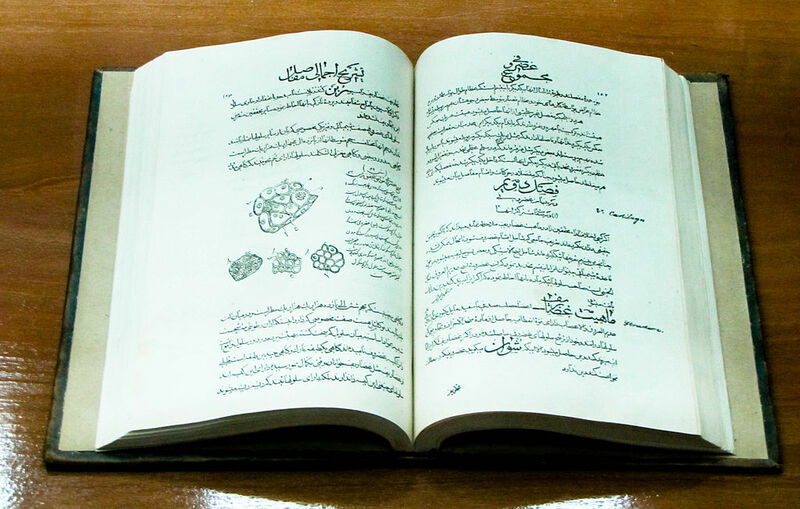 There The Canon of Medicine (Al-Qānūn fī al-ṭibb) became the preeminent source, rather than al-Rāzī’s Kitāb al-ḥāwī (Comprehensive Book)." Figure 10. The drawing of Ibn Sina on a Libyan stamp. Figure 14. 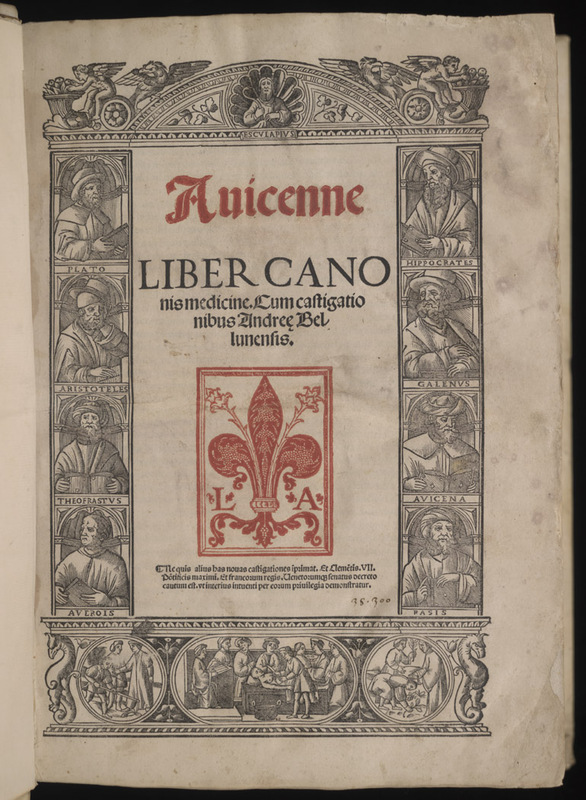 Frontispiece of the Latin Version of the Canon of Medicine, printed in Venice in 1595 (from, Il Canon medicinae di Avicenna nella tradizione ebraica: Le miniature del manoscritto 2197 della Biblioteca Universitaria di Bologna. A cura di Giuliano Tamani. Padova; Editoriale Programma, 1988; p 21. [italian]). Figure 21. 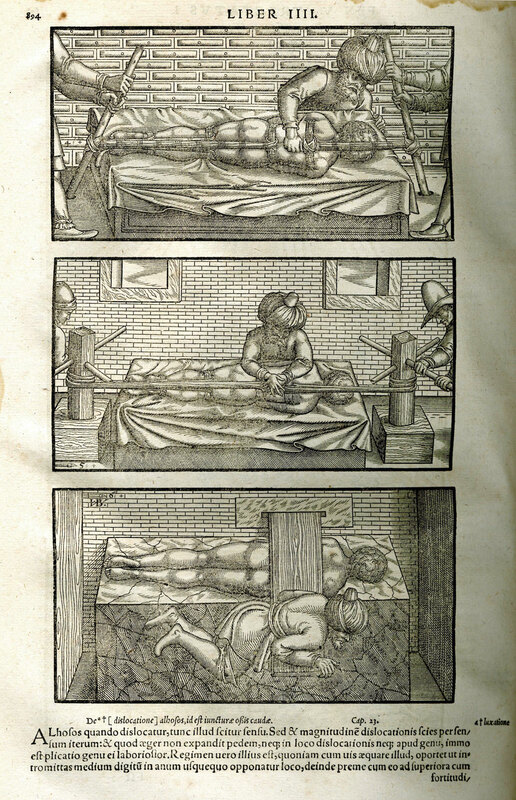 Galen, Ibn Sina, and Hippocrates, the three authorities on medical theory and practice in a woodcut from an early 15th-century Latin medical book. (Source). 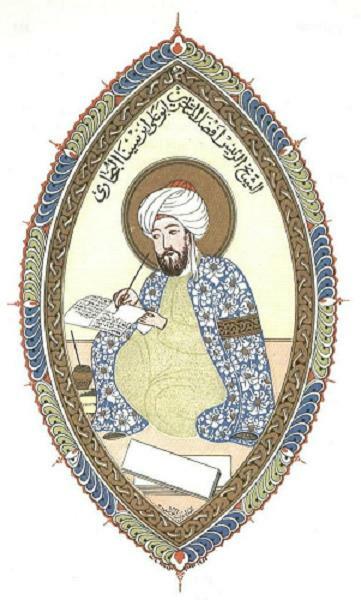 Ibn Sina drawing by A. Suheyl Unver. (Source). Commemorative medal issued by the UNESCO in 1980 to mark the 1000th birth anniversary of Ibn Sina. 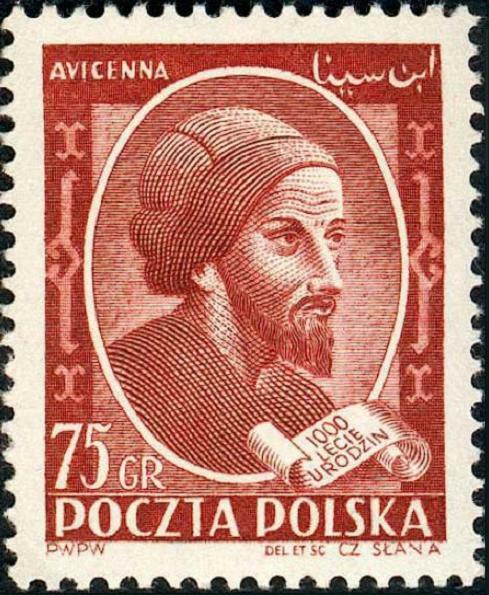 The obverse depicts a scene showing Avicenna surrounded by his disciples, inspired by a miniature in a 17th-century Turkish manuscript; whilst on the reverse is a phrase by Avicenna in Arabic and Latin: "Cooperate for the well-being of the body and the survival of the human species" (Source). 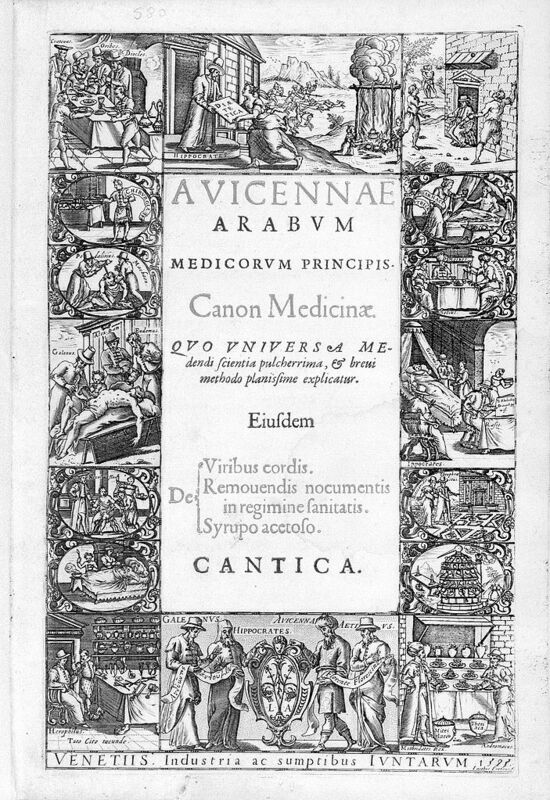 The title page of a Latin Edition of Ibn Sina’s “Canon of Medicine” together with two of his other works; Cardiac Medicines and the Medical Poem (the Cantica Avicennae) published in 1562. 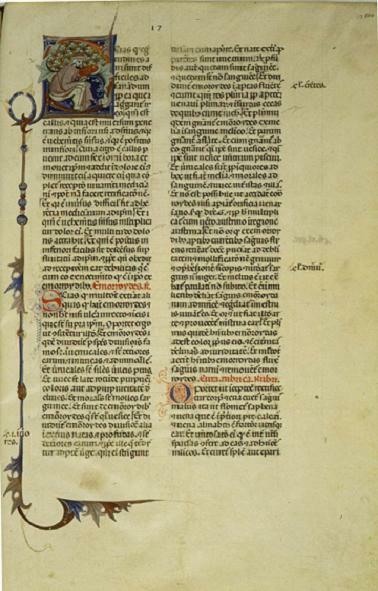 The page on the right is page 1082; the beginning of the Cantica section. Courtesy of Google ebooks. 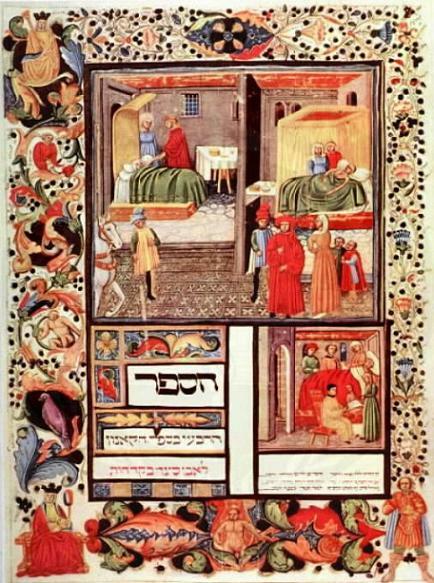 Figure 4: An illustrated page of theCanon in a Hebrew translation. The miniatures shown here are the three basic stages of a physician's visit with a patient: the examination of the patient, the consultation with attendants, and possibly a written prescription or treatment procedure. (Source). 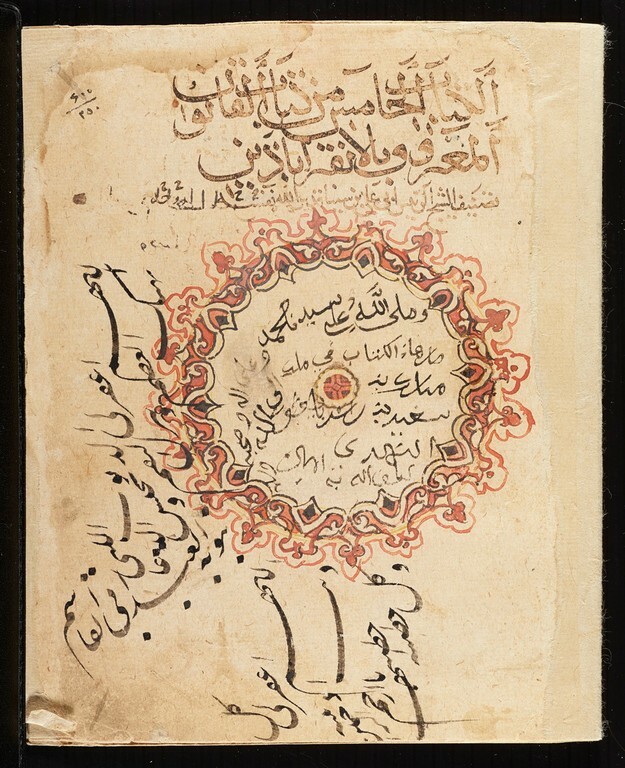 Page from an illuminated manuscript of the Latin translation of the Canon of Medicine by Ibn Sina (Source). 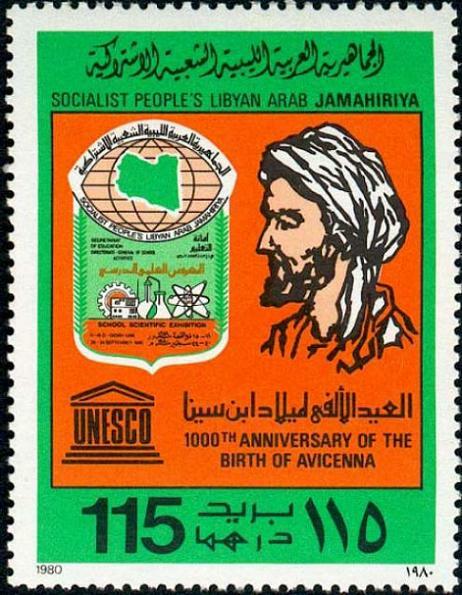 The drawing of Ibn Sina on a Libyan stamp. 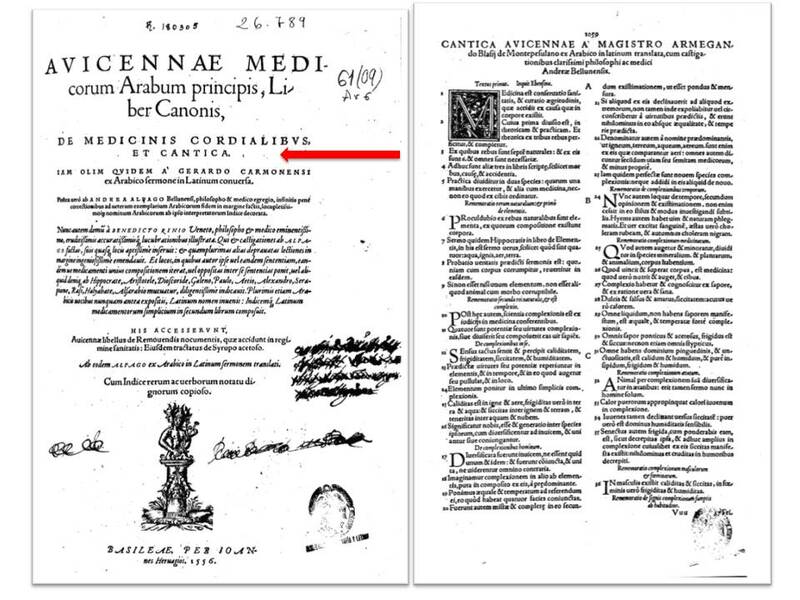 Frontispiece of the Latin Version of the Canon of Medicine, printed in Venice in 1595 (from, Il Canon medicinae di Avicenna nella tradizione ebraica: Le miniature del manoscritto 2197 della Biblioteca Universitaria di Bologna. A cura di Giuliano Tamani. Padova; Editoriale Programma, 1988; p 21. [italian]). 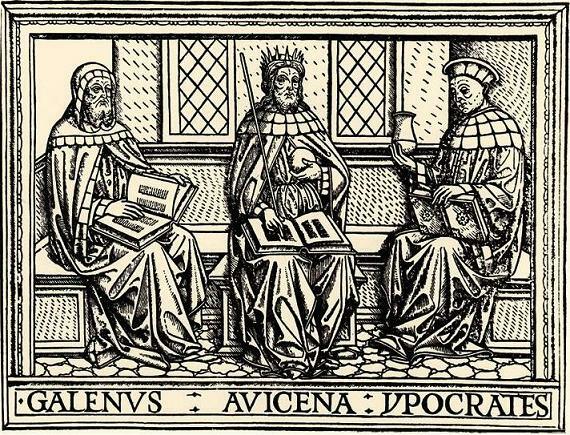 Galen, Ibn Sina, and Hippocrates, the three authorities on medical theory and practice in a woodcut from an early 15th-century Latin medical book. (Source).